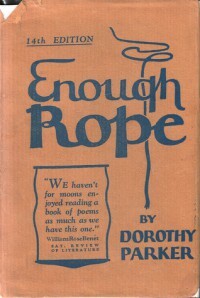 Enough Rope was first published in 1926. Marion Meade notes in her biography of Mrs. Parker, Dorothy Parker: What Fresh Hell Is This?, of the book's popularity and appeal. It became a bestseller and enjoyed several reprints (remarkable for a volume of poetry at the time) and earned praise from readers and reviewers. This is ostensibly her breakthrough work, one that extended her reach from the Algonquin Round Table into the American lexicon. Perhaps then people mimicked her quips with the same regularity as we quote movie dialogue today. When you open the book, you realize first thing Mrs. Parker isn't going to let you slide through the book without feeling her anguish. Enough Rope opens with "Threnody," which means "lament." Her heart is "shattered," and she wants you to know that she's still alive and "every likely lad in town / gathers up the pieces." As Mrs. Parker writes it, though, it doesn't sound like a message of hope, of finding love after a disappointment, but the inevitable setup for another round of misery. "The Small Hours" - The listless speaker bemoans the nights and finds no comfort of the coming sun. "The False Friends" - Resentment of well-meaning friends who attempt to bring cheer. "The Trifler" - Heavy flirting with Death, perhaps a reference to a failed suicide attempt in which Death is blamed for its failure. "A Very Short Song" - Another lament of heartache, also an acknowledgement that she's as capable of creating it. "A Well Worn Story" - Love with the wrong person, and the eventual fallout. More than once Mrs. Parker refers to April in her poetry - a month significant as the beginning of spring and renewal and hope, yet she rarely finds it. "Convalescent" - A resolution to get over lost Love ends with the resignation that she'd willingly take him back regardless of how badly she feels. "Epitaph" - She speaks of two deaths: the first emotional and the second physical. The "gleaming pain" between my ribs could suggest a broken heart, and the image of lying warm in the earth implies relief and comfort in death. All together in this one book, you could form the story of a woman weary from worldly experience, pessimistic about true love and wishing for an early end, only to find it so much of a chore that maybe it's better to let nature take its course and resign yourself to harmful vices while you wait.